There are currently 171 people online. 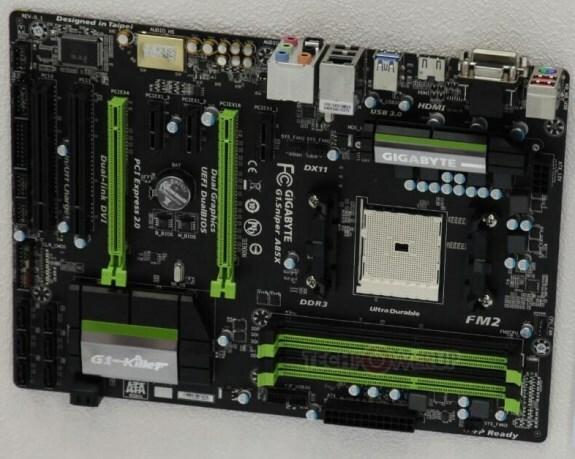 TPU published a picture of Gigabyte's upcoming G1.Sniper A85X, an ATX motherboard for AMD's Socket FM2 Richland APUs. The FM2 socket is wired to four DDR3 DIMM slots, which support up to 64 GB of dual-channel DDR3-3000 MHz memory; and a pair of PCI-Express 2.0 x16 slots (electrical x8/x8 when both are populated). In addition, the board offers three PCI-Express 2.0 x1, and two legacy PCI. The board shines in connectivity, where it offers eight SATA 6 Gb/s internal ports, a combination of DVI, D-Sub, and HDMI display outputs, Creative Sound Core3D audio with user-replaceable OPAMP and audio-grade capacitors, four USB 3.0 ports, and gigabit Ethernet. The board is driven by AMI Aptio UEFI BIOS, backed by GIGABYTE Dual-UEFI redundancy, and the new BIOS interface that made its debut with GIGABYTE's socket LGA1150 motherboards.